I was 19. The summer after my last year of high school was coming to an end and I was starting university in just a few week’s time. My parents and sister moved back to Victoria (my old hometown) and my brother was already out of the house living on his own. In a way it was like I went away to school but in a reverse sort of way in that I didn’t leave my family; my family left me. Sure my brother still lived in Ottawa but we weren’t all that close at the time. I moved in with the daughter of a family friend and her boyfriend. They were housesitting for her parents who were out of country for the year. I’ve always been pretty self-sufficient as a child so I knew I could take care of myself (I could cook, do laundry, etc.) but it was worrying to have to pay rent, buy groceries, adjust to life as a university student while working, etc. All of this with no real fall-back option. If I couldn’t make rent, no one was going to bale me out. Managing a budget those first couple of months was interesting indeed (thank you ramen noodles). Juggling it all wasn’t easy but having good friends as roommates helped. We had a lot of fun that year together. We made meals together, celebrated holidays together, had movie nights, study nights and yes, the odd party night. As much as life “on my own” was tough (life on a student budget is tight), it was also liberating. I made my own decisions. I was accountable to me. Yes, I had to pay my rent on time, do my share of house chores, etc., but it was all so much fun. The funny side to all of this is the idea of my daughter someday moving out at a similar age is simply inconceivable. That time is still many, many years away but the idea of her leaving for school or “moving out with friends” at 18 or 19 years of age is just…no. Not happening in any reality I am comfortable living in. Obviously I know she will leave. Eventually. One day very far off in the future. 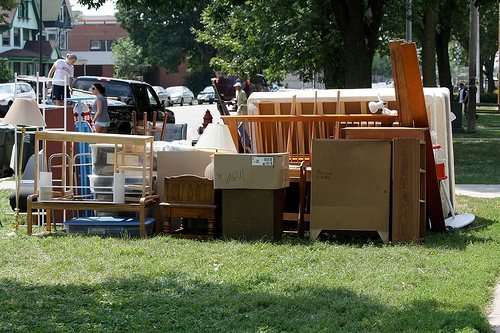 Your turn: How old were you when you moved out on your own? Did you leave home in your late teens, wait until your early twenties or… gasp! … your thirties? The first time I left home I was 19, and then I moved back. Then I left home at 20 for 2 years, and then I moved back. Then at 22 I left again, came back, left just before my 23 birthday, came back and left permanently, finally at 24 I moved in with Joe. Right after we got married my sister left for university in BC and my mom sold her house and moved to Saskatchewan. No going back. No more safety net…scary and liberating all at once. 24 or 25? After university here in Ottawa. They’re still in the same house. I have a key. Bwahahahahahahaaa! I left home when I was 15. I was a stubborn child. My mom and I got in a stupid argument and I moved out. I was too stubborn to go back home. Wow – 15. And I thought leaving home at 19 was young! Aw, the stubbornness of youth…you did what you felt was right for you at the time. I was 23, after college, moved here to Ottawa. I remember how free I felt, and my rent ate up an entire pay check every month. But I didn’t care. I loved it. Ha, the good old days. I moved out when I was 19 and my father so nicely said, “you can never move back home” , he meant it. I was not-quite-19 – I have a fall birthday. I moved into university residence for my first year, then into various rental slums after that until I graduated. Even now I wonder how my mother ever let me go, and so cheerfully too. It was a wonderful gift she gave me – I cannot imagine myself being so gracious. They will pry my babies from my COLD DEAD HANDS :).